Jacobs wasn’t just a writer. Like Saul Alinsky and Ella Baker, she was a pioneering community activist who broke laws and disrespected sham political process. It’s hard to image today’s obedient liberal class celebrating Jane Jacobs for shredding public hearing documents, getting arrested and being charged with criminal mischief and second degree rioting. “I hate the government for making my life absurd,” she told the journal Government Technology in 1998. But like any dead visionary, once they’re gone, a radical’s words can be dissected and watered down. Just this month Grace Lee Boggs was eulogized by Detroit Free Press reporters at the same time they diminished her life’s work in Marxism and Black Nationalism. Like Boggs, like so many other historic figures, the observations of Jacobs are being eroded by the likes of CityLab in order to serve a political purpose. She is paraded as inspiration by a clan of real estate promoters who operate with much of the same destructive ambition as Robert Moses. It’s a testament to the true legacy of Jane Jacobs that neoliberals covet her image to con the public. It’s a sad mark against the public that she’s been marginalized so easily. “The New Urbanists want to have lively centers in the places they develop, where people run into each other doing errands, that sort of thing. Yet from what I’ve seen of their plans and the places they have built, they don’t seem to have a sense of the anatomy of these hearts, these centers. They’ve placed them as if they were shopping centers that don’t connect.” JJ. For more of Jacobs’ urban analysis, watch the short film below. 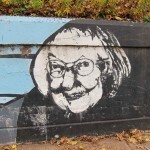 This short documentary features acclaimed author and activist Jane Jacobs‘ forthright, critical analysis of the problems and virtues of North American cities.